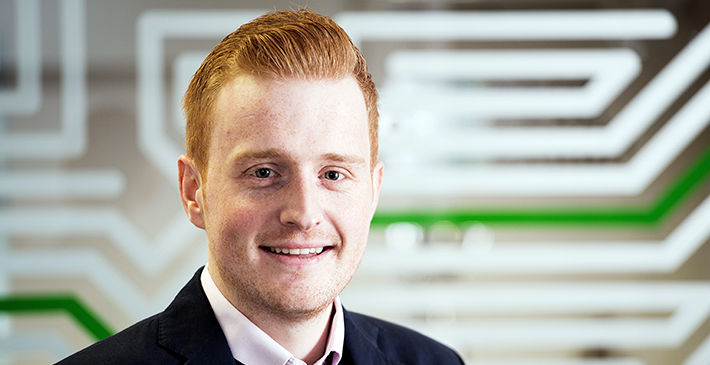 Ryan Pellow is a Global Account Manager at NCAB Group UK and has been working here since 2010. What persuaded you to start working at NCAB? NCAB had a very good reputation throughout Europe and I liked the Swedish culture. The feeling that you’re a part of a team that is making a difference was a big attraction. What do you like most about working at NCAB Group? NCAB focuses on the personal development of each employee. From the very beginning I have always had a strong mentor who has shared their knowledge, encouraged my growth and matched my enthusiasm. I have never been held back and I have instead been pushed to exceed expectations. "My managers have basically said: what training do you want? And then they have supported me. How great is that!" Ryan Pellow about how the development possibilites within the NCAB Group. NCAB is a value-based company – how would you say that the values affect your daily work? It’s in our blood: Strong relationships – this value is in every element of my life. Quality first – we’re always striving to be better and improve. Full responsibility – It’s not the supplier’s problem, it’s our problem. I have never experienced a company where every value is adopted by all employees until I came to NCAB. This is unique. How can you describe the development possibilities within the NCAB Group? My managers have basically said: what training do you want? And then they have supported me. How great is that!?! The feeling that they’re willing to invest in you and are looking further in to the future is very refreshing. Sustainability is an important part of NCAB´s business – in what way does the sustainability work affect your daily work? During the last couple of years, our customers are starting to see the benefits of sustainability. We use ISO 26000 as a USP now. We are one of the first, and it builds brand confidence.